Central Park Zoo with Hodel & Savannah - Super Inky! After Savannah, Hodel, and I finished exploring the Egyptian Wing at The Met, we decided to walk down to the Central Park Zoo. Since Savannah had some time before she had to go, we thought it would be fun to show Hodel the red pandas. Of course, Hodel has seen them before- but never our red pandas, Biru and Amaya! 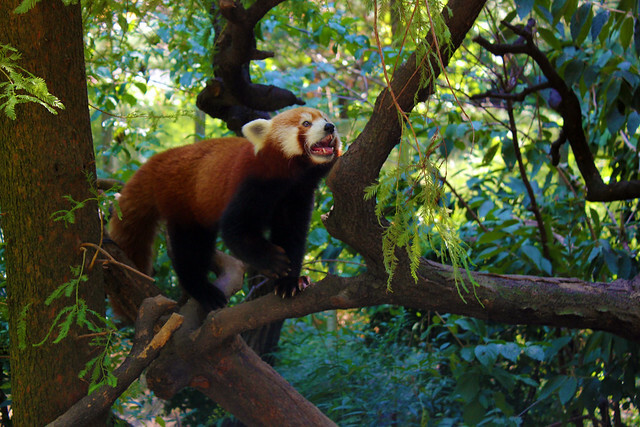 After drinking some sodas in the Dancing Crane Café, we headed up the hill to see the red pandas, my favorite animal! We skipped the tropic zone because that exhibit is really warm and it was a hot day. The red pandas were outside playing- I was so happy! Biru, the male, came right up to us on his tree, so I snapped this picture. He may look gentle, but his teeth are sharp. Yikes! After visiting the red pandas, we climbed to the top of the hill to see the Snow Leopards. No one was in the first exhibit, but when we got to the second one, this beautiful cat was resting right by the window. Wow! 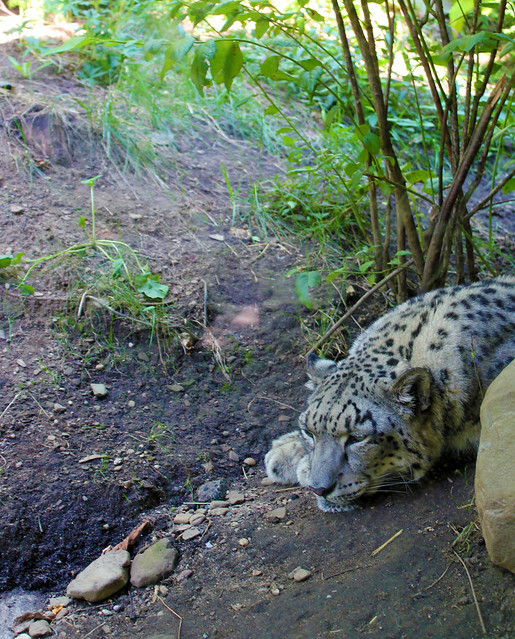 We were so lucky to get to see a snow leopard that closely. After the snow leopard, we passed the polar bear (who was not out) and sped through the penguin exhibit, which was very crowded. After watching the sea lions for a little while, we said good-bye to Savannah and headed on to our next destination. So far, a great a day! I'm so glad Savannah was able to join us at The Met and the zoo. 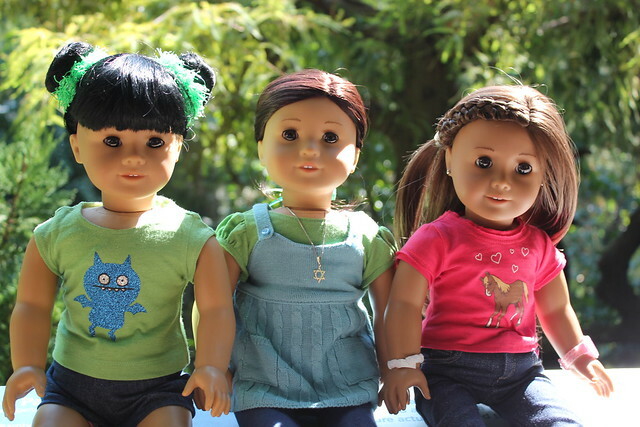 Have you ever gone on a special outing with a new friend? That photo of Biru is postcard perfect! He's so cute! Did I see him? I can't remember. I know I saw Amaya. I've gone on a lot of outings with new friends! Most recently, I met up with Maya and Katherine at AG Natick. While I knew of them because of our YouTube channels, I'd never met them in person before our store visit. We looked at new AG items together and then had lunch. It was a great day! I don't think you met Biru- he only came to the zoo recently. I'm sure next time you visit that you will get to see him though! Red pandas are my favorite animal, too! I've never gotten to see one outside of pictures before, but I really want to some day! The picture you took of the red panda is so adorable! It makes me want to run upstairs and grab the red panda hat my friend Dani made for me for my birthday!!! Dani made you a red panda hat? You should send me a photo of it! It sounds AWESOME! INKY DONT CHA JUST LOVE IT THERE? My person and I love red pandas but my fav animal is totaro (watch my neighbor totaro if you didnt aready! )I went there while Arianna was at chello recital. RED PANDA PARTY? I am thinking about having a red panda themed party, do you think I should do that? I have no ideas. And I'm VERY lucky because my Bday is on 12/12/12! Isnt that SO cool? I've never seen My Neighbor Totoro, but I've seen lots of Totoro toys and books at the Japanese bookstore by Bryant Park. Wow, your birthday is coming up soon! I hope it's a happy one!